Home > News > Fit For Life! Billion Steps Program – Let’s go Australia! 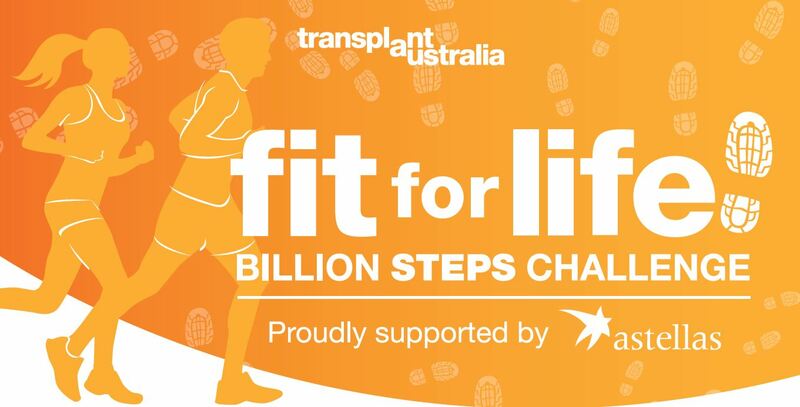 Transplant Australia is committed to helping all transplant recipients take the first steps to a ‘new normal’ – a life where physical activity is part of their everyday lives. We are pleased to support the Fit for Life! 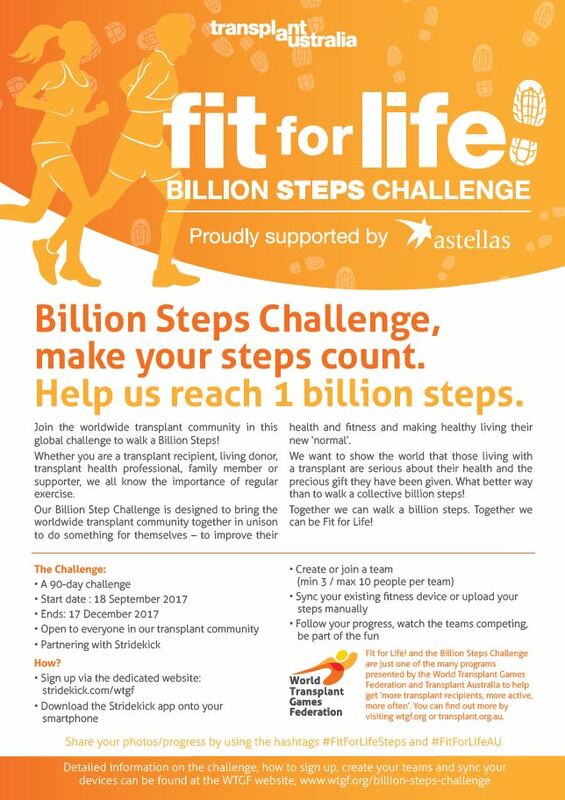 Billion Steps Challenge which aims to encourage the worldwide transplant community to collectively walk a billion steps. The World Transplant Games Federation will commence the Challenge on Monday, September 18. It is part of the Fit for Life! Program, proudly sponsored by Astellas. The aim is simple: over a period of 90 days, we challenge the transplant community to walk/run a billion steps. It’s open to transplant recipients, living donors, transplant health professionals, family members and supporters. Our Australian goal is: to walk the coastline of Australia (25, 760 km) four times. Our Australian fundraising goal: to raise $10,000 to fund research around long-term effects of transplantation. To join our fundraising effort, click here. We have partnered with Stridekick, a website/app which captures daily steps. Stridekick syncs with most fitness trackers and also allows manual entries for those who don’t have one. The Billion Steps Challenge is a TEAM challenge. Everyone who takes part will need to register through the Stridekick App and join a team. Each team is allowed a minimum of 3 and maximum of 10 people. If you do not have a team nor wish to create one, please join WTGF Steppers. Transplant Australia is encouraging transplant units to create at least one team and inspire recipients to achieve their goals. Please share this with physiotherapists and other staff directly connected with getting recipients active. As an incentive in Australia, the first 10 teams to sign up will all receive a free Fit for Life! t-shirt. For more information on how to get started please visit Stridekick. We look forward to seeing you on the challenge. Thanks for your support!